This blog article is about how to find a particular driver and firmware of an I/O device like a HBA, Network card etc.! For VMware VSAN there is a nice health checker now but not everyone is using VSAN and not everything in a ESXi system involved in VSAN like Network Cards and local devices. The vm-support is a great source to understand ESXi for what hardware is in use and obviously many other things. I am about to write a series about vm-support and online troubleshooting of ESXi but decided to start with this first. In case you have an issue one of your devices it is sometimes not quite easy to find out what the current driver and firmware is. In the commands folder of your vm-support (/commands) you find a good number of files starting with localcli_* as well as esxcfg-*. I am sure you are aware of esxcli but what is localcli? It is the equivalent to esxcli but won’t go through hostd. This is important because there could be an issue with hostd so the vm-support would never finish. It is clearly not recommended to use localcli within shell itself. Let’s assume you would like to know what the driver and firmware version is for the below shown vmbha0. The best file to find all local storage adapter is the following file. Next we want to find out what driver version is installed after we know that vmhba0 is using the driver lsi_mr3. Please keep in mind that the Install Date is not the Driver Date! I had the situation quite a few times that a customer thought the Install Date = Driver Date. The following grep statement will find the device VID:DID SVID:SSID. ~ # esxcfg-info -a | grep -B 1 vmhba0 | grep -A 1 Display. Another option to find out the four values is: vmkchdev -l then look for vmhba0. 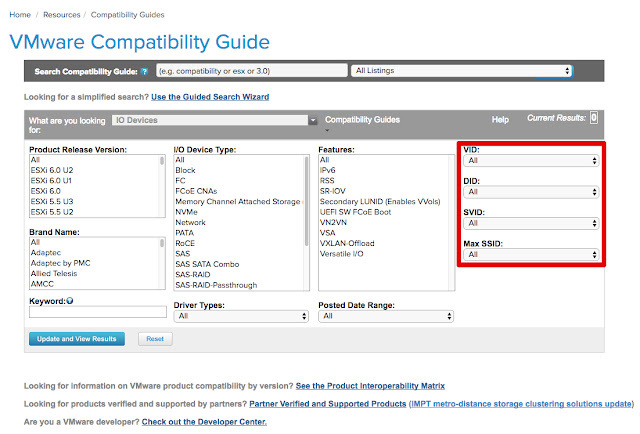 There is a very good VMware KB 1031534 for this as well. Now as you have the four options you can follow this link (VMware Compatibility Guide) to put in the four options. The driver itself is very important but the firmware of a device is similar important. In this case you just look for the vendor. First we need to know which vendor vmhba0 is. Storage Array Type Device Config: SATP VMW_SATP_LOCAL does not support device configuration. To find more information about the device itself look at: ~ # esxcli storage core adapter list -d naa.500003965c8a394c. You will find the model also in the the esxcli storage core adapter list command or you just search for Toshiba. With this information you can now check with your vendor if you are running the latest and greatest firmware. I hope you liked this very quick and short blog article and as always if you have any questions, concerns or recommendations please don’t hesitate to contact me.